We have been using molecular and chemical structures for many years to improve our teaching and understanding of biology. As we started using molecular models more frequently, we realized it would be helpful to have defined sets of structures that could help students meet specific learning goals and use guided inquiry to investigate phenomena. Structure collections save time in preparing for class and grading assignments. Instead of downloading twenty structures for twenty student devices, we can download one collection on each device or have the students do this. Internet access is not needed once a collection has been downloaded. Collections save time in searching databases and identifying the best structure. Problems where students mix up characters like 1' and l's or O's and 0's are avoided. Annotated structures can be stored. Structures can be organized and compared. Each of Molecule World structure collection has been compiled with certain learning goals in mind. We have added collections over the years to accompany museum exhibits, textbooks, and curriculum. If you have an idea for a collection, let us know! We're happy to help. A collection of antifreeze proteins. Antifreeze proteins are found in a variety of species that tolerate cold temperatures. These include arctic fish, antarctic bacteria, plants, insects, and mold. All of these proteins bind to water and lower the freezing point. Can you figure out what these proteins have in common besides their function? Chemical and molecular structures that accompany the upcoming edition of Biotechnology: Science for the New Millennium, by Ellyn Daugherty. 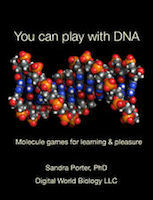 Chemical and molecular structures that accompany the Bio-ITEST Genetic Testing curriculum strand. Includes NEW structures! Investigate structures of DNA and determine if other molecules (protein or other chemicals) are bound in the major groove of the DNA or the minor groove. Use this collection of structures to see how molecules interact with DNA. Both proteins and drugs bind to specific sequences in DNA by recognizing the three dimensional shapes. These structures are from aligned pairs of drug-sensitive and drug-resistant influenza proteins bound to different types of antiviral drugs. Comparing the pairs of structures shows how a single base mutation can allow a virus to become resistant to a drug. Molecular structures of selected receptors and some of the chemicals they bind like capsaicin and wasabi.